A friend of mine who is living in Mexico shared this tip with me from the ladies in her town: store your unripe avocados in a kitchen drawer (any kitchen drawer where you have space and will remember them) and they’ll ripen perfectly. Guess what – it works! Once they’re ripe, eat them right away or extend their life for a day or two by transferring to the refrigerator. 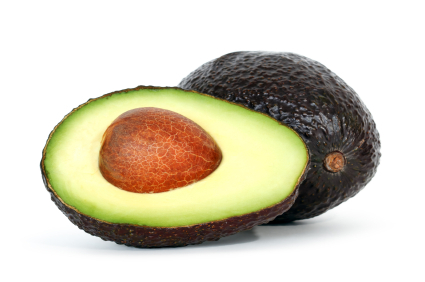 Store cut avocados with their pit to prevent browning. I love avocados – and they’re especially great this time of year. You can find lesser known varieties in local co-op groceries right now that are even better than the standard Hass or Fuerte – Pinkerton is deliciously sweet, creamy and good for eating right out of the shell. I squeeze a little fresh lime onto a freshly cut avocado half and sprinkle a little sea salt for a satisfying snack. Avocados are good for us in so many ways. They may be high in fat, but it’s a GOOD fat that you actually want in your diet. Avocados are high in monounsaturated fatty acids, including oleic acid and linoleic acid which can help with balancing cholesterol levels. They are loaded with potassium – even more than bananas – and high in Vitamin E, B vitamins, Vitamin C and Vitamin K – a vitamin that is important for bone health, calcium metabolism and healthy arteries. Great for our skin, metabolism, and muscles, avocados are what I like to think of as a “healthy operating system” food for our bodies. Eat them on salads, in sandwiches, in a green smoothie, or even out of the shell. A recent visit to a fabulous restaurant – Gracias Madre – in the Mission district of San Francisco inspired this salad. Easy, creamy and delicious – enjoy! In the bottom of a large heavy salad bowl, mash the flesh of your perfectly ripe avocado along with the lime, salt and garlic clove. Toss with chopped romaine and finish by tossing with grated Parmigiano-Reggiano, cherry tomatoes, if using, and serve immediately.